Earlier this week on Facebook I confessed I do not want my kids to be “nugget kids.” This isn’t entirely the truth. What I do not want is my kids to request chicken nuggets every night, relying on an old-favorite instead of trying new foods. I have my wants and wishes for their food preferences, and clearly, they will and already have their own. Since I’m not entirely anti-nugget and assume some day they’ll order the trusty standby at McDonalds or Wendy’s, I want them to also have “mom’s version” that they love just as much OR even more! 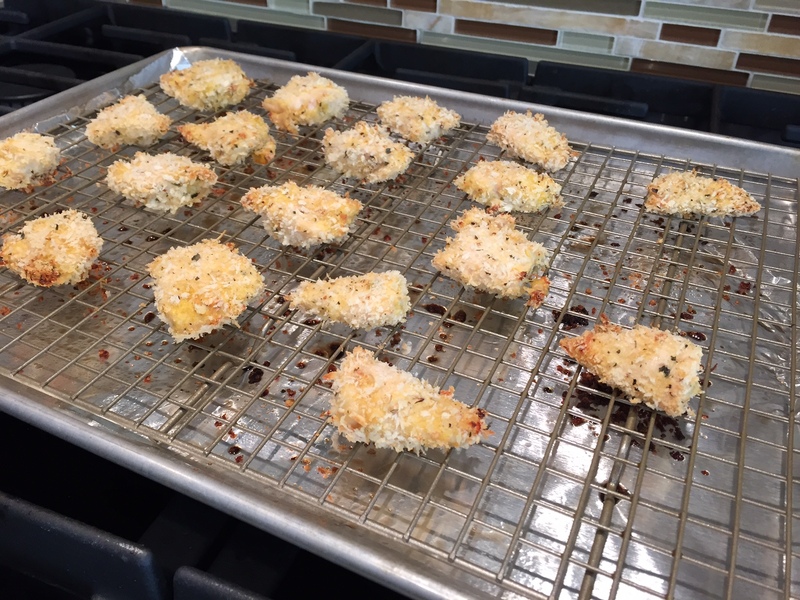 Because homemade tastes better than bribery in my book, I came up with panko-crusted chicken nuggets. Walk through the freezer section of any grocery story and you’ll see boxes and brands of chicken nuggets. You’ll also see an ingredients list with words a little more complex than “chicken.” Now don’t feel bad for buying frozen chicken nuggets— there’s a time and place for them [mom’s sick, kids are sick, kids skipped naps, etc. etc.]. But if you have an extra 10 minutes while your oven is preheating and the kids are occupied and happy, I’d highly suggest trying out this healthier version. 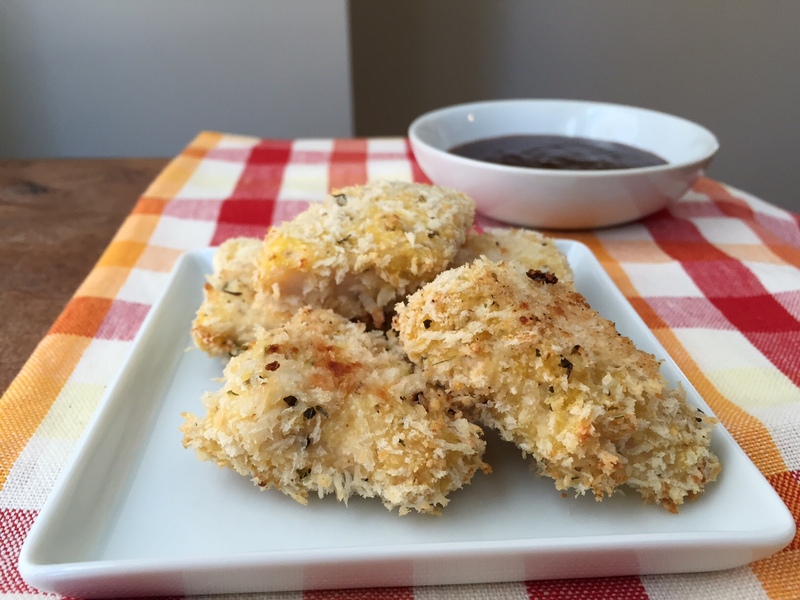 My gal pal Kristy at Chocolate Slopes inspired this recipe as it’s sort of a cross between two of her recipes: Italian Baked Chicken Tenders and Panko Crusted Cauliflower Bites. I also tried two variations of this recipe: one with the nuggets baked directly on the foil and another batch baked on a wire rack. 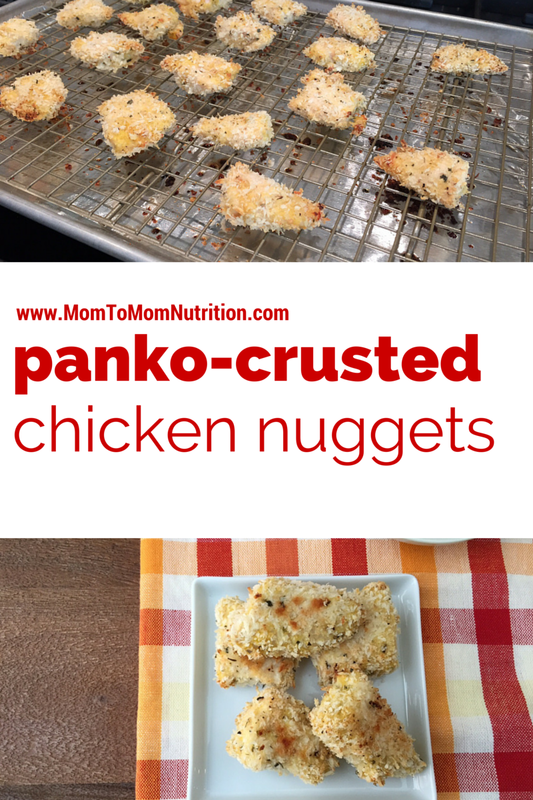 Both turned out crispy, but the nuggets baked on the wire rack definitely came out crispier! Preheat the oven to 450 degrees. Place a wire rack on a baking sheet lined with foil. Coat with cooking spray. 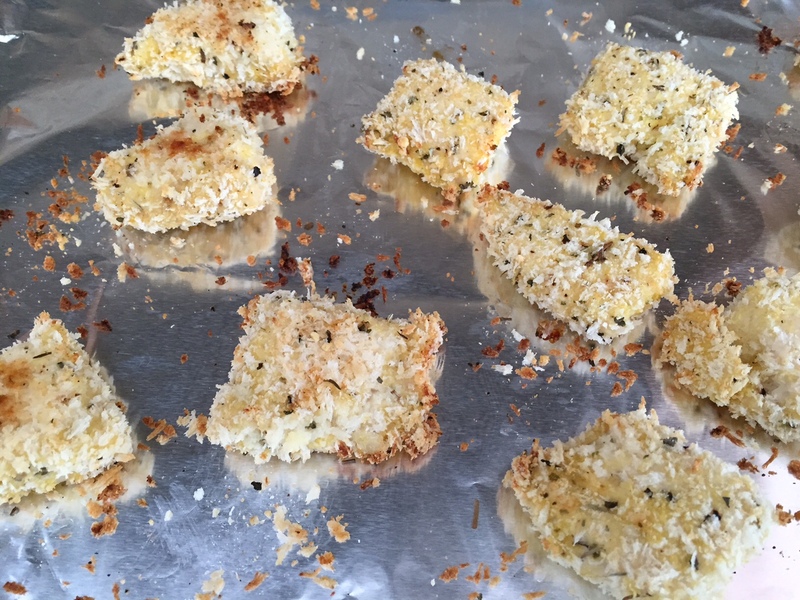 In a shallow container, combine the panko breadcrumbs, Italian seasoning, and cheese. In a separate shallow container, whisk together the egg and Dijon mustard. Working with one chicken piece at a time, dip the chicken in the egg mixture. Then immediately dip it into the breadcrumb mixture, completely coating the outside. Transfer the coated chicken to the wire rack. Bake until the chicken is cooked through and the breadcrumbs start to brown, 7 minutes per side. Have you ever made homemade chicken nuggets? If so, what’s your secret to crisp them up? So glad you enjoyed them – what a fantastic idea to combine them! And my kids will also not be “nugget kids” lol. You read my mind! This morning I woke up thinking “I want some sort of breaded chicken for dinner tonight” and you’ve got the perfect recipe! These look so yummy. Can’t wait to try them tonight! I hope you and the guys liked them! So cute! Much better than those nasty processed ones! I make a similar recipe with thinly pounded chicken breasts or cut into strips. I haven’t made them as nuggets before though – super cute like that! I’ve also found they come out most crisp on a wire rack! I much prefer giving my kids homemade nuggets over store bought. I have a recipe I use, but yours looks even better! Gonna pin so I can make it soon! thanks!! Yum!! I’m writing a menu right now for a local juvenile center and they want to serve homemade chicken nuggets. I am going to suggest this recipe!! Ahhh! Awesome!! I hope they enjoy them as much as we do here!